In this article I want to share with our clients the importance of and how to install popup drains. The purpose and importance of popup drains is to carry the hundreds of square feet of roof-water runoff out and beyond the foundation of the home or business. While the best time to address the issue of roof-water runoff is during the building phase of a new structure or when existing driveways and walks are being replaced, most do not have this option. Sadly, very few builders address this issue and it blows my mind as to why this cheap and simple process is left out during the final grade phase of home construction. With the many home construction codes that exist, at the very least, builders should be required to send all gutter water out and away from the foundation of the new home. Since this is not the case, the prospective buyer must require the builder to do this during the planning stage. If not, in most cases, it will not happen. 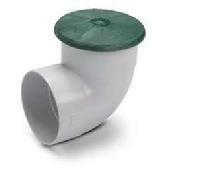 You will end up with ugly green splash guards at the downspout section of your guttering. Since Curb Sensations borders our continuous; meaning they are one continuous, flowing piece from starting point to ending point, they are in effect a four inch high damn around flower beds. Without popup drains the runoff water will become trapped between the foundation and the border with nowhere to go once the ground is saturated. With this in mind, Curb Sensations requires our clients to do one of three things prior to installation of borders. 1. Install sufficient popup drains yourself. 2. Contract to have us install them at a cost of $80.00 per 10 foot maximum length. Additional lengthening will add cost to the basic 10 foot drain cost. 3. To sign a waiver on the contract stating homeowner has been informed of the issue of water runoff inside the Curb Sensation installed continuous concrete borders, curbing or edging and does not wish to have popup drains installed. 1. With the help of Curb Sensations, determine where the borders will be installed and make certain to extend popup drain to one to two feet beyond the outside edge of where border will be. It is important that drain is out and away from where border will lay so as to allow us to have a nice flowing radius uninterrupted by an obstacle. We are very particular about the way our borders look and flow. 2. Each drain will require the proper size downspout adapter, 4 inch black corrugated pipe, black 4 inch 90 degree elbow, a inside to inside corrugated connector or coupling and a popup drain. Word of caution here, avoid taking the cheap way out by skipping the popup drain and allowing water to daylight out into the grass. This will require an ankle breaking hole in your yard which is hard to see. Also avoid the temptation of using the accordion style one piece gutter drains. They are not designed for underground installation. Each item needed may be obtained from most home improvement stores such as Lowes, Ace or Home Depot. 3. Remove the metal downspout elbow from base of gutter. Dig a six inch deep trench out to where the popup will be positioned. Cut to fit a small piece of corrugated pipe which will sit between the gutter adapter and the black elbow. Then install your cut to length main stretch of pipe and fit the inside to inside connector from pipe to popup. Then cover with dirt and place lid onto popup. 4. When Curb Sensations installs popup drains we are careful to cut sod away so that we can place it back at end of process leaving little to no bare spots.